Yodel-eee-ayy-hoo! Are you ready for a Bavarian blast? Perhaps you'd like to hike the Alps and sound an alphorn. Or maybe you'd like to attend a folk dance and do the Schuhplattler dance. Or maybe you'd just like to post up for 16 days of Oktoberfest! Hey, whatever kind of old world fun you'd like to have, we'd say that we encourage it and totally recommend it. As long as you have a costume! That is kind of our gig, being costume experts and all, so we'll always recommend going in costume. But when you have the chance to dress up for the occasion and you can mix in some humor, too, well that's when the fun is really gonna happen. 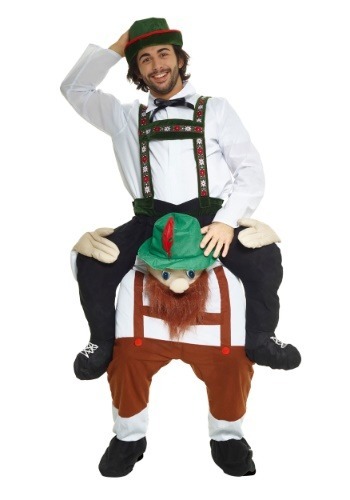 So, just suit up in this Bavarian Piggyback Adult Costume, and you'll be ready for the good times! This detailed costume comes from our friends at Morphsuits, as a part of their famed piggyback series. These amazing costumes are detailed costume pants that create the illusion of you riding a little character. And that's because they include an extra pair of legs, arms, and a little soft-sculpted head! This Bavarian costume is really one for the ages. The little soft-sculpted German guy has a full furry beard, and a signature cap. Our picture shows the wearer with his own Lederhosen suspenders and hat on, but those pieces are sold separately. Your order will include the costume pants, and you just have to stuff the legs with newspaper or other suitable filler to achieve the desired effect! There's no saying what kind of adventure you'll encounter when you suit up for a trip to Bavaria, even if you're trying to bring Bavaria to you! Just choose this Piggyback costume, and you'll be all set for the fun. Shop our entire selection of Morphsuits costumes to see more amazing choices, too!